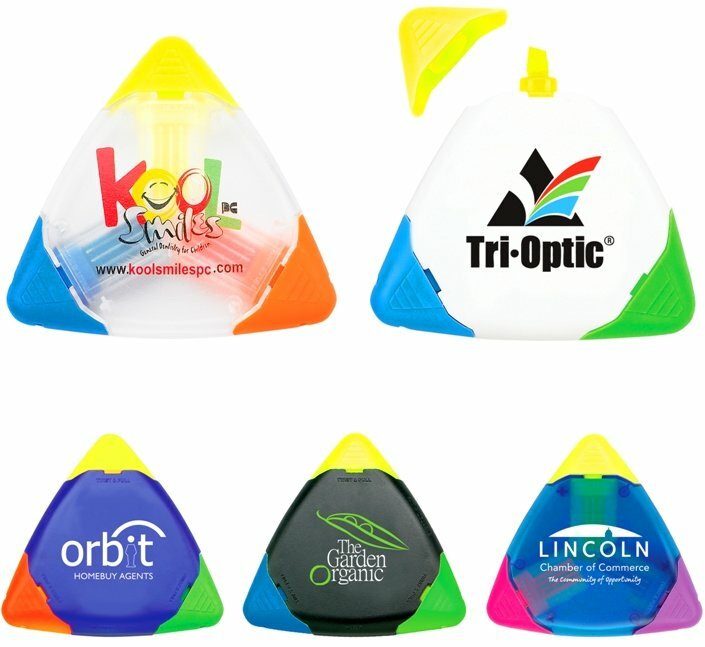 DriMark custom promotional highlighter has almost endless applications. Famous for quality, triangular easy to use shape and large imprint area. Features include quality plastic construction and 3 large ink reservoirs. Body Colors: Clear, White, Reflex Blue, Black or Translucent Blue. colors of Blue, Pink, Orange or Green for the other two. Overall size 3 5/8 x 3 5/8. Poly bagged, bulk packed. This highlighter is Made in the USA. Price includes a one color imprint one side in area 2 3/8" w x 2" h.
add setup of $30 and a running charge of $.25 each unit. Four color process imprint setup is $50, run $.45 each. Two sided imprint add double the charges for either. Logos do require an Illustrator ai, eps, pdf art file.